She keeps spitting every few minutes but the taste of urine still seems to linger in Bisahin Bai’s mouth. The humiliation of having been forced to drink urine and paraded naked continues to haunt her. That was 14 years back but the memory is fresh. Sitting in her mud house in Lachkhera in Gariyaband district in Chhattisgarh, Bisahin Bai finds it difficult to erase the horrifying memories. Bisahin Bai along with Shyama Bai and Teerath Bai are waiting for justice after suffering assault, being paraded naked, tonsured and forced to consume urine after being branded ‘Tonhi’ (women involved in witchcraft) by the villagers. The village is just 92 km from the state capital Raipur. Seventeen out of the 20 accused in this crime were sentenced to a year in jail but they walked free after their case went to the high court. The lower court had asked the accused to pay '1 lakh each to the victims but till date nothing has been paid. Bangles and gold chains of the victims are still in court custody which were seized by the police from the possession of the assaulters. Assault on women for ‘practising witchcraft’ is not new to Chhattisgarh. In the last decade the tribal-majority state witnessed around 1,500 incidents and 210 deaths. “They branded me as a witch, tonsured my head and paraded me naked in front of the villagers,” Bisahin Bai recalls incoherently amid tears, clutching the hand of Teerath Bai. “When I think of that day, it still sends shivers down my spine,” she says. Then her tears silence her for a few minutes. She wipes her face with the end of her grimy saree. Even 14 years later, that memory remains painful to her. It was 10 am when a group of men dragged them one by one from their houses by the hair. “We were pleading but they kept accusing three of us of practising Tonhi and bringing ill health to a man in the village,” Teerath Bai says. “The men kicked us. Not a single person in the village came to our rescue. They asked all three of us to hold live electric wires. They said if you are not a witch, nothing will happen to you,” Teerath adds. Shyama Bai remembers the horror of being stripped. When they refused to take off clothes the men forcibly stripped them and made them walk in the village. “We were made to jump in the fire. Our mouths were parched, but when we asked for water they urinated into our mouths instead. We were left to die, bleeding profusely. We fainted. They threw water on us and made us sit in the village square,” she recollects. “All three of you are witches,” they were told. “They hit us with sticks and asked us to untie our hair. They started shaving our heads right there,” Shyama Bai says. Bisahin, the most timid of the three, takes up the story from Shyama, her hands and body shaking as she talks. “I was menstruating then. I was bleeding all over. I was naked in front of the men in the village. They paraded us around the village and beat us and finally left us outside the temple,” she says. “Somehow, we managed to drag ourselves to a hospital far away. Village elders did not allow us to file a police report. We went to the police station on the pretext of going to hospital,” she says. The prime of her life was spent in isolation. Today, Bisahin is in her 50s.She is confident and has shown courage to earn livelihood by working in a farm, but she is not sure if the practice of harassing a woman after labelling her a witch will ever come to an end. She is fighting back, and seeks to set an example by reclaiming her life. Bane of tribal areas Accusations of witchcraft are not uncommon in tribal areas. 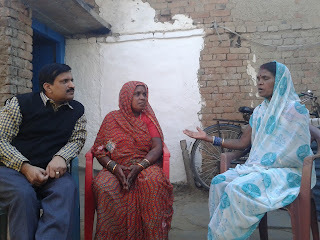 If things go wrong in a village or family – an illness or death, crop failure, an accident – uneducated villagers can be easily persuaded to blame some vulnerable member of the community. Teerath says they were lucky that they were not killed. Sometimes the accusation even results in a death sentence. Last year, police registered 200 cases of witch-hunting; most of them in tribal areas. Unfortunately, back then when Teerath, Shyama and Bisahin faced their ordeal, police usually did not get involved in such cases. Bisahin Bai’s mother passed away shortly after her daughter suffered the harassment, she couldn’t bear the humiliation. Bisahin’s brother says he has lost all hope of securing justice for his sister, and regrets not being able to help her. Ray of hope And yet there is some hope. All the three victims would have never dared to come out in open and start living a normal life if an ophthalmologist wouldn’t have come from Raipur to help them out. 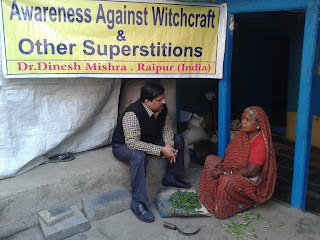 Dr Dinesh Mishra is fighting against black magic and superstition. He helped Bisahin pursue the criminal case and also encouraged her to come out of her inhibitions and contest panchayat polls from her village. Though she lost the polls held in January this year, it gave her the much-needed confidence to rebuild her life. “Humiliation for these women doesn’t end with lodging an FIR, they are kicked out of family and village, forced to spend life in isolation. In most cases, the women die waiting for justice,” Dr Mishra says, adding that he is now campaigning to move such cases to fast-track courts so that the victims get justice soon. Chhattisgarh introduced the Witchcraft Atrocities (Prevention) Act in 2005. However, this and other laws are found to be not sufficient in countering the surge in witch-hunting crimes. Dr Mishra’s organisation, Andhashraddha Nirmulan Samiti, has been fighting for the cause since 1995. “We are not getting any financial or administrative support but this is not stopping us from running our mission,” he says. The campaign and more awareness among villagers, he believes, will bring an end to this inhuman practice going on in the state and other parts of the country since ages. Dr Mishra says most cases of witch-hunting he comes across are prompted by illnesses and diseases. “If people are educated about the causes of their diseases, they will stop believing that their neighbour is responsible for it. I try showing them viruses and bacteria through the microscope and tell them this is the real cause of their diseases,” he says. Why witch hunting? Rashmi Mishra, a journalist in Raipur, who has reported on Tonhi incidents extensively, says, “When an instigator mobilises a whole community, collecting evidence or getting witnesses becomes a problem. Police need to be trained to handle such situations.” Radhika Saxena, who teaches sociology at the Pandit Ravishankar Shukla University, Raipur, and specialises in family, marriage, rural sociology, explains, “The trigger could be a death or a series of unfortunate incidents, but we have also seen that witch hunts are also triggered by motivated and vested interest. Chhattisgarh has witnessed more than two dozen cases of atrocities against women, leading to the death of eight victims. According to the state commission for women, Raipur district topped the list with 10 cases last year while Balrampur, Rajnandgaon, Raigarh, Janjgir – Champa and Koriya were other affected districts. State women and child development minister Ramsheela Sahu categorically states that women are getting more protection in the BJP regime, and the government is strict in implementing law and order. But he fails to explain why the government has not been able to eradicate the Tonhi cult. A senior police officer in Raipur said that there are several reasons, such as gender inequality and property disputes, behind the labelling of women as witches. Branding a woman as a witch is “a common ploy to grab land, settle scores or even to punish her for turning down sexual advances”. “It is difficult for the harassed woman to reach out for help and she is forced to either abandon her home and family, commit suicide or is brutally murdered. Poor, lower-caste women are easy targets for branding as a witch. Women who are widowed, infertile, have ‘ugly’ features or are old, unprotected, poor or socially ostracised are easy targets,” the official said. According to Women News Network (WNN), which reports on gender issues, women who become powerful and thus threaten the male leadership can also become the target of witch hunting.